A national warning over the danger of forest fires has been upgraded to RED for the rest of this week. The warning states a 'Condition Red - Immediate Fire Risk. Take Immediate Action". The warning is effective from today Tuesday 12 noon June 26, until 12 noon this Friday June 29. "Arising from current prolonged high pressure weather patterns, high temperatures and effective drought conditions, an extreme fire risk is deemed to exist in all areas where hazardous fuels exist. 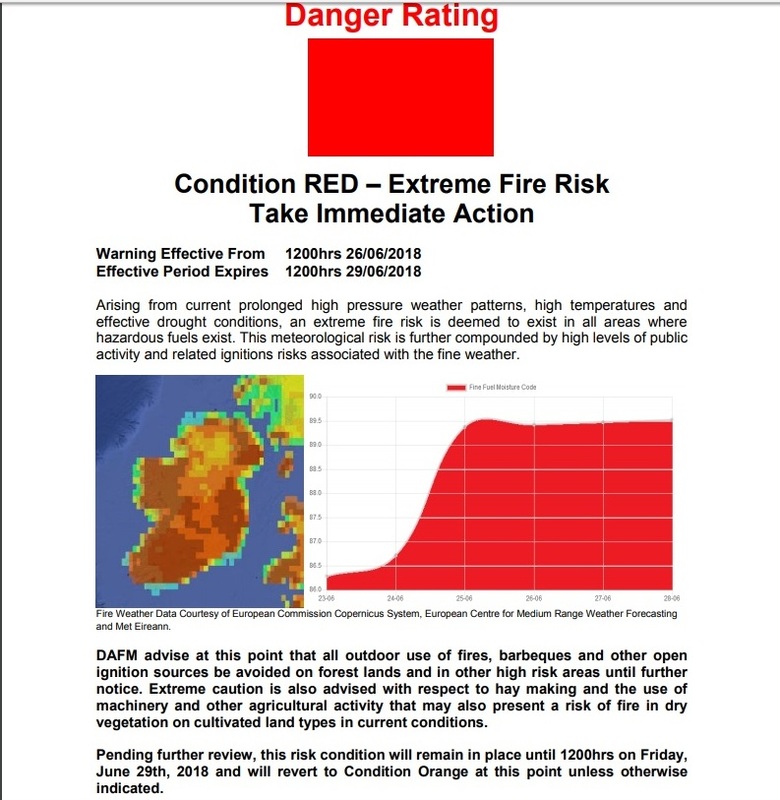 This meteorological risk is further compounded by high levels of public activity and related ignitions risks associated with the fine weather" the warning from the Forestry section of the Department of Agriculture, Food & the Marine. The Department of Agriculture says the issuing of Condition Red Extreme fire risk warnings is a comparatively rare event and implies that recipients should take immediate action to protect resources and property. Such action may involve the mobilisation, assembly and prepositioning of resources such as water tankers, machinery, personnel and air support in high risk areas. Laois is one of the more forested counties in Ireland, along with having extensive tracts of dry bogs and the vulnerable Slieve Bloom mountains. Laois County Fire & Rescue has stated that it is "highly dangerous at present" to light fires near open land or forests. "Anyone cooking outdoors also needs to exercise extreme care, including safe disposal of single-use bbqs in a safe manner". "If you see a fire keep a safe distance away and report it immediately by calling 999 or 112. Read warning in full here.